The end of August and beginning of September mark the start of the school year, and it can end up being a very stressful time for parents to prepare for. On top of purchasing new school supplies, picking out new clothes and organizing drop-off and pick-up schedules, you ideally want to send your kids off with thoughtful and nutritious lunches for school to feed their growing bodies and stimulate their developing minds. Establishing healthy eating habits should start while kids are young, and lunchtime at school is the easiest time to break that habit because lunches take preparation and it’s hard to guarantee kids will even eat what you give them. With that said, hopefully these five tips for packing healthy school lunches will make things at least a little bit easier! 1. Let Your Kids Help Decide. Sit down with your kids about once a week or every other week to discuss specific foods in each food group they prefer. Let them choose from a few options of grains, fruits, vegetables and protein they’d like to eat for the week – all within reason of course! Bacon all day every day is obviously a hard no. However, it’s important to compromise as well. 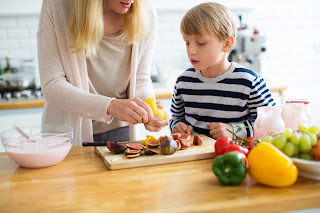 If kids are constantly being forced to choose only from options they hate, then they can easily resort to dismissing their lunch completely or sneaking unhealthier options elsewhere. It’s all about balance and letting kids have a feeling of responsibility over the meal’s creation, which shows them that their lunch is an outcome of their decisions, and they may therefore be happy to eat it. Maybe you can even choose a day of the week for a “cheat” item and another day of the week to introduce a new type of food they haven’t tried before. There have been a few viral images going around of parents creating extremely imaginative school lunches for their kids, even coming up with items that depict cute animals or popular cartoons. While insanely cool, it’s probably extremely unrealistic and too time-consuming for most parents. Still, there’s something to be said for the fact that kids really do get more excited for food that is interesting and interactive and/or encourages play. Some easy ways you can achieve this is by using cutouts to create cool shapes out of their food, incorporating a lot of color throughout and preparing the entire meal in bite-sized portions. White bread seems to be the easiest thing to reach for when it comes to prepping school lunches. It’s cheap and a popular base for the quintessential sandwich. However, it’s almost void of any actual nutritional value. Opt for whole-grain bread instead, which may take longer for kids to get used to but provides much more nutritional value, including fiber, protein and important vitamins and minerals. The same goes for any type of refined grains, such as white pasta and white rice. Experiment with unrefined alternatives like quinoa, brown rice and lentils. More than anything else on this list so far, this is probably where you’ll have to be the most careful. While it’s impossible to completely rule out added sugars at all times, try to replace them with natural sugars or at least limit your kids’ intake of them. This means replacing processed soft drinks, fruit drinks, candy and desserts with unprocessed fruits, honey and yogurt – just to name a few. Making this change in your children’s diets can significantly reduce their risk of diabetes and childhood obesity. Meal prepping is not just for the body builders of the world. In reality, it’s probably most useful for busy parents who have to worry about juggling a million things at once, so prep lunch and snack options over the weekend that you can then simply toss in your kids’ lunch boxes during the week. It’ll ultimately save you valuable time, and you can avoid becoming a frantic mess in the mornings! If you happen to have any personal tips for healthy lunch ideas for kids, feel free to share them in the comments below. We parents need to stick together! Information is very informative also you get same from a site, this is the great resource to get such type of information.